There’s a lot of talk surrounding organizational culture — what makes it good, what makes it bad. More often than not, organizations just leave their culture up to chance. But that’s definitely not the way to go about it if your desire is to create an engaged workforce and a thriving business. Culture has the power to influence recruitment and retention. And it makes sense. A poor culture drags down employee sentiment and productivity. Our Employee Engagement Report discovered that organizational culture is one of the top factors correlated to employee happiness. Every company needs a direction. Your mission statement highlights the company’s goals and what it’s striving to achieve. So to create and maintain a strong culture, it has to be molded from the top down. Creating a mission statement will keep employees all on the same page and driving in the same direction. If you’re going to create goals, stick with them. Even if you hit a bump in the road (financial losses, turnover, etc. ), it doesn’t give you permission to stray from the organization’s mission. Remember, your mission is your company’s GPS system — it tells everyone else where they need to go and why. According to our research, less than half of employees know their organization’s vision, mission, and cultural values. Plaster your values all over the walls, highlight employees who embrace them, and make your business decisions based off of them. If you, the manager, aren’t living your organization’s values, then your employees won’t either. What are the benefits of hiding information from employees? It might seem less complicated to wait until you have confirmation or you’ve made a final decision, but doing that creates an air of assumptions. Be transparent with your information and keep employees in the loop so they know what’s going on in the business. 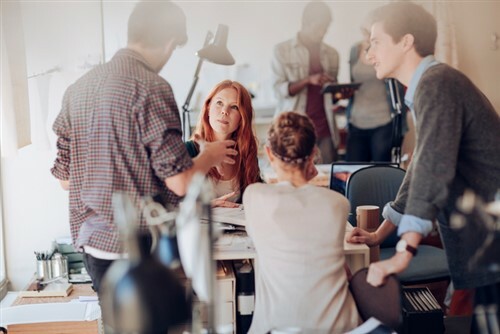 Employees are the ones in the trenches, so they should be empowered to offer up suggestions to improve their work environment. When you keep them happy, you’ll enjoy a much more productive, engaged, and loyal workforce. As part of keeping employees happy and listening to their feedback, you’ll also have to be open to change. If something’s not working in the culture, get your employees involved with finding a solution to the issue. This will also help eliminate the us-versus-them mentality between leaders and employees. Don’t wait until the annual review to high-five an employee. Do it right on the spot. When an employee goes for a long period of time without any recognition, they start feeling unappreciated and unvalued. And when that happens, you end up with unmotivated and less productive employees. A survey by PGi states that 88% of millennials are actively looking for a fun work environment.So give your employees a break from their tasks by having some fun. Whether it’s just a weekly team walk or a potluck, there’s nothing better than showing your employees that work can be an enjoyable place to be. If you’re going to have a recurring fun event, don’t forget to throw in some spontaneous celebrations. Did someone close a big deal? Pop a bottle of champagne. Maybe your team has finally completed an important project. Take them out for dinner. Having only routines can get redundant, so shake things up once in a while to add some flavor. Many organizations think that having a strong culture means being crazy. But don’t mix up those two. Yes, some cultures are more outlandish than others, but create one that suits your workforce and the brand. Throwing around a beach ball or having Friday afternoon happy hours may or may not work for team morale at your organization. When it comes to creating a community, hire people that are already embodying your culture in their everyday life. Use your organizational values as a basis for interview questions as a means to measuring how well they’ll mesh organically into your culture. A business won’t be able to succeed if you constantly have employees butting heads. Create spaces where employees can spontaneously interact with one another. Think longer hallways, open seating areas, or break rooms. Doing this will encourage and foster a culture of collaboration, which can result in some great innovative ideas. Employees don’t want to be boxed in for life. They want to be at an organization that will nurture their professional growth, so offer opportunities for them to expand their skill sets. Whether it’s offering extra training, moving them into another position, or letting them work on different projects, you’ll be able to keep them sticking around much longer. How much longer? 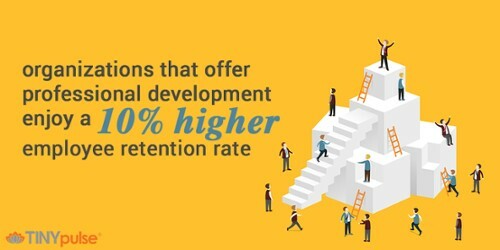 Organizations that offer professional development have a 10% higher employee retention rate, according to our research. Just like you’d measure finance and productivity, you need to measure and assess your culture. Are employees happy? Do they feel engaged, or are there factors that are keeping them from completing their work? Use a simple tool like a pulsing survey to source this information and keep tabs on how your culture is holding up. Zappos has their own culture. So does Google. And so does your own company. Don’t try to replicate other organizations. You can adopt certain aspects, but when you try to become a clone, your culture becomes inauthentic. So figure out what works best for your organization and your employees. An organization’s culture is the heart of a company. A strong one keeps your employees engaged and working to their full potential. So if you want this for your company, then keep those golden rules in mind.